Sounds pretty good, doesn’t it? If only it were that easy. 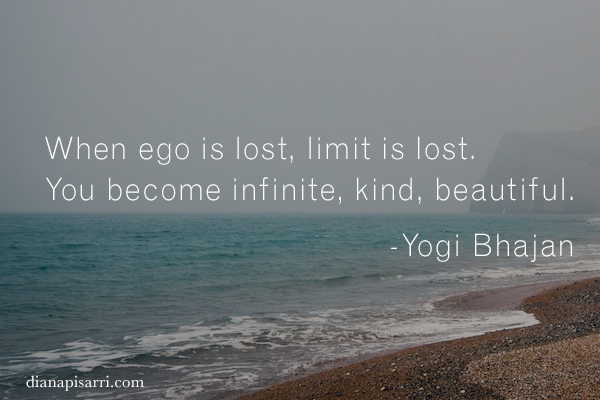 The ego is something we encounter often in our yoga practice. My crow pose needs work. His chaturanga is stronger than mine. Inversions are not for me. The ego invites difference, comparison, and competition—in short, the opposite of yoga, which represents wholeness, unity, and integration. I will never forget my first Kundalini yoga class, in which the teacher asked us to hold our arms out straight at our sides while chanting a mantra for ten minutes. I have never felt so weak or given anyone the hairy eyeball for so long. Sometimes the battle against the ego is about surrender, whether it’s letting go of appearance or results, but what if we could work with the ego instead of against it? While yoga teaches us that we are part of a universal whole, the ego reminds us that we are human. When we chant the sound of “om” or feel deep gratitude, the practice of yoga reminds us that we are all connected, made of spirit. But we are still corporeal beings, and it is beautiful to be human and to be part of this earth. The ego can be that thread. The key to balancing the ego lies in how we identify ourselves. Your body, with all its perfectly imperfect flaws and limitations, is not all that makes you human. Your thoughts and the way they have a tendency to overpower your intuition are not what make you human. You are not just a teacher, lover, mother, son, friend, athlete, or pet owner. You are part of a whole, a universal self. An ego that is infinite. An ego that is kind. An ego that is beautiful. When you practice with a community of yogis and everyone’s breath feels like one breath, or everyone’s feet land in a lunge at the same time, that is the infinity of the self. When you place your hand on your own heart and acknowledge this truth, you are embracing this ego rather than letting it control you. It’s part of you. You are part of this world. We all are.